Washington Post says Trump ‘played up’ the story for ‘political advantage’. A parade of leftists proved Tuesday that they will oppose absolutely anything the President does when they expressed anger at Trump deporting an actual Nazi. On Tuesday, the Trump Administration announced that the last remaining Nazi on American soil will be deported to Germany, after over a decade of negotiations with Obama and Bush administration officials failed to prove fruitful. The Immigration and Customs Enforcement Agency arrested 95-year-old Jakiw Palij in Queens, after it was agreed with the German government that he will face punishment there. Noted Nazi apologist Donald Trump orders actual Nazi death camp guard to be deported to Germany. That’s correct, Donald Trump, who is labeled a fascist by unhinged leftists every minute, deported an actual Nazi death camp prison guard. Was that enough to temporarily please his detractors? Of course not. In fact to some, including “New media artist” Thom Dunn, it was evidence of Trump trying to cover up his own fascist tendencies. Those have to be the most confusing days. Yes, that’s a writer for GQ, and he’s still employed. He deleted the tweet and passed it off as ‘a joke’. Of course a bunch of MAGA shitheads thought my Nazi guard conspiracy theory joke was serious. They believe all sorts of conspiracy theories. Anyway tweet deleted, I don't have the energy to deal with a bunch of chuds this morning. So reporting that they have deported a literal Nazi, one of the last ones IN THE WORLD, is no more than them seeking political advantage. That is very cynical by the Washington Post. This is a big story, and deserves to be reported in a fair and impartial manner. So, first ICE separates 2000 Central American children from their parents. 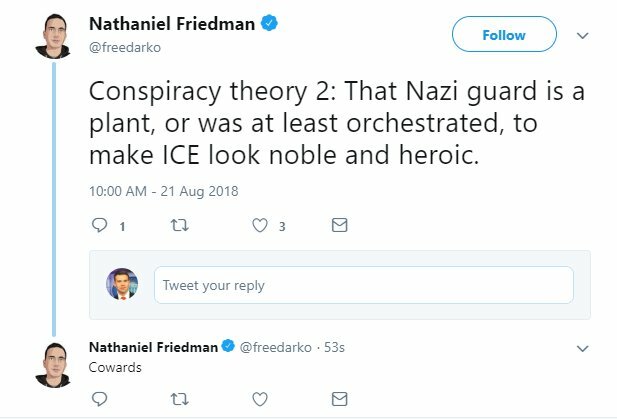 Then ICE deports one Nazi 70 years after his heinous crimes. And the RNC wants to crow about it? Even the German government said there wasn't enough evidence to connect him with any crimes. Dude lived here for 70 years without incident, worked, had a family, the works. Meanwhile cartels flood the borders and skin people alive. The German government of today are in on the witch hunt. Ugh. Deporting Nazis for the wrong reason. That's lovely. But i'll take it. Thanks Donald – for getting rid of the least threatening Nazi in the country. Now will you please do something about the heavily armed young ones who meet in the woods and like to march? Thanks so much. It's quite convenient. Throw them out to the dogs when they are not needed. The US was quite happy to take former Nazis when it needed help building its space program. V2 rocket scientists anyone? If it's Nazis they're looking for, maybe they should check out a Trump rally. They want credit for throwing the bathwater out with the baby. Sorry not buying it. Nazis deporting Nazis, that's my take. I'm still waiting to hear the evidence backing their belief of what he did. He sure looks dangerous on that hospital gurney. While being silent on the Russian collaborator in the White House. So, there you have it, the left sides with actual Nazis over the US President. Libs and the Left are never satisfied. So you’re siding with Nazis over the US president now?